Along with "disguting rat." Because rats are, you know, disguting. You want Benedict Cumberbatch being adorable? I'm about to make this page Awesome Central for Benedict Cumberbatch being adorable. 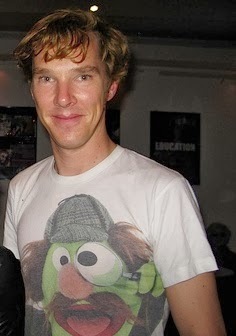 Benedict + Muppets = Adorable. I hereby protest against the aspersions cast on rats! When did Davy Jones disappear? Has his locker been searched for clues? So I finally got around to seeing August: Osage County. And while I have to say that adorable is in the eye of the beholder his performance in that was...words fail me. You know that saying about how there are no small parts? From now on that performance can be held up as the ultimate illustration of how true that is. He took a small part and made it memorable. I'm focusing on this partly because after seeing the first thing on the list of things bringing people here I wanted to go bleach my brain.